The bank note that the British Museum added to its collections was sent to it by ‟Pest Control″ which represents Banksy and checks the authenticity of his works. Banksy is now one of the most well known artists in the UK and the British Museum acquired its first work created by the street artist. It is the ‟Di-faced Tenner”, a counterfeit ten pound note with the face of Princess Diana, instead of the Queen’s, on which ‟Banksy of England” is printed, instead of ‟Bank of England”. Banksy made it in 2004, seven years after Di’s death, intending to use it in a performance. The anonymous graffiti artist—widely believed to be Robin Cunningham—says he had printed 100,000 such notes to scatter them off the top of a building. Now, they are for sale on eBay priced from £1.99 up to £750 each, even though many of them are reproductions and not some of Banksy’s counterfeit copies. The banknote that the British Museum added to its collections was sent to it by Pest Control which represents Banksy and checks the authenticity of his works. Oddly enough, the Museum decided that the work belongs to the department of Coins and Medals and not to Engravings and Drawings. The authentic ten pound note which Banksy based his work on was withdrawn from circulation last March, but those who have a few left over can exchange them for the new ones at the Bank of England. 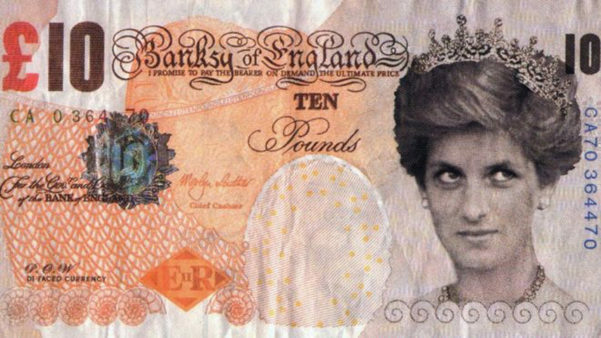 The spokesperson of the British Museum announced that for the time being there are no plans to exhibit the ‟Di-faced Tenner”. Tom Hockenhull, the museum’s curator of Modern Money, put its photograph in the latest issue of the British Museum magazine.